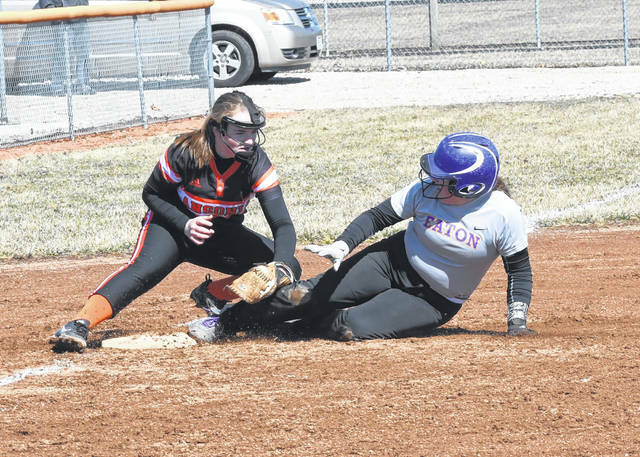 Eaton’s Rilee Worley throws to first to get an Ansonia runner out during the first game of doubleheader on Saturday, March 30. 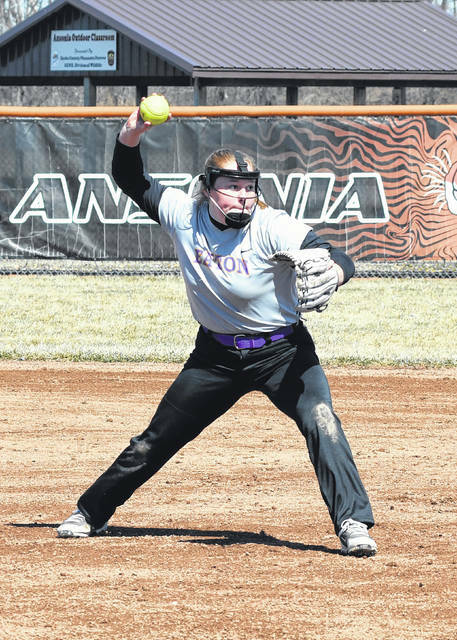 Worley went 6-for-7 at the plate and drove in seven runs as Eaton swept the Tigers 12-1 and 8-2. 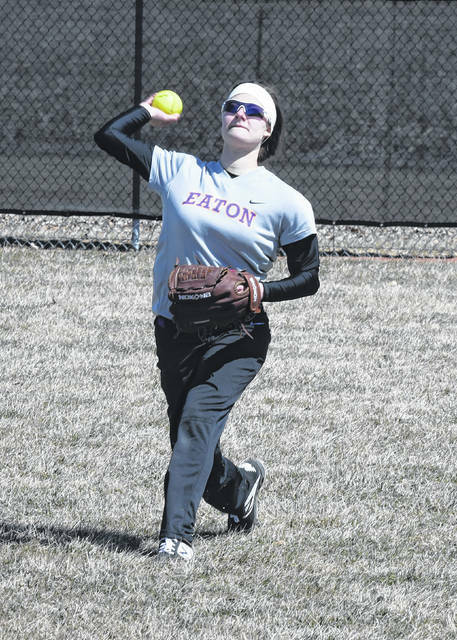 ANSONIA — Eaton’s softball team is off to a good start after sweeping both games of a doubleheader at Ansonia on Saturday, March 23. The Eagles pounded out 27 hits in the two games, winning game one 12-1, in 5 innings, and 8-2 in game two. Junior Rilee Worley had a big day for Eaton. She went 6-for-7 in the two games and drove in seven runs. 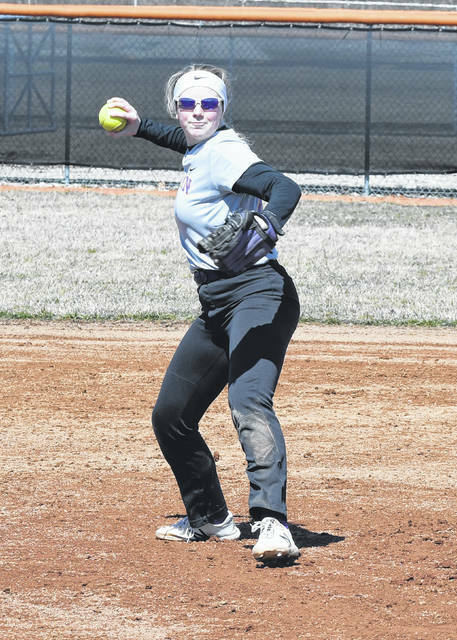 Junior Bailey Shepherd went 4-for-8 on the day and scored five runs from her leadoff spot in the lineup. 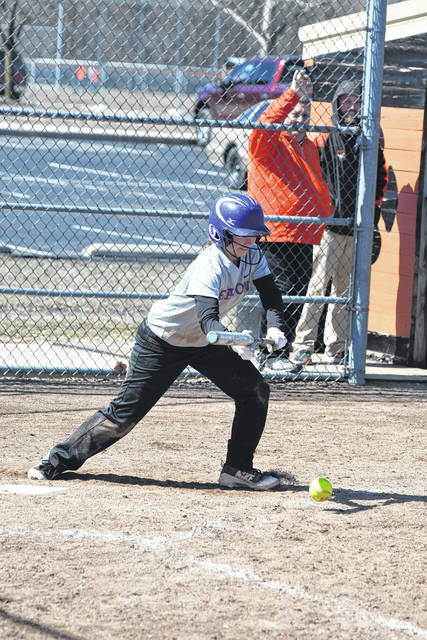 Junior Ashley Earley added three hits and four RBI. Senior Becca Mowen went 4-for-8 with a pair of RBI. Also adding multiple hits on the day was senior Emily Dungan (3-for-6), sophomore Lexi Miller (3-for-8) and senior Annika Gels (2-for-6). In game one, Eaton scored in every inning, scoring two runs in each of the first four innings before closing out the game with four runs in the fifth. Worley went 4-for-4 in the game. She singled in the first, singled in the second, singled in the fourth, and doubled in the fifth. Gels retired the first nine Tigers and was credited with the victory throwing four innings, allowing one run on one hit, striking out seven and walking none. 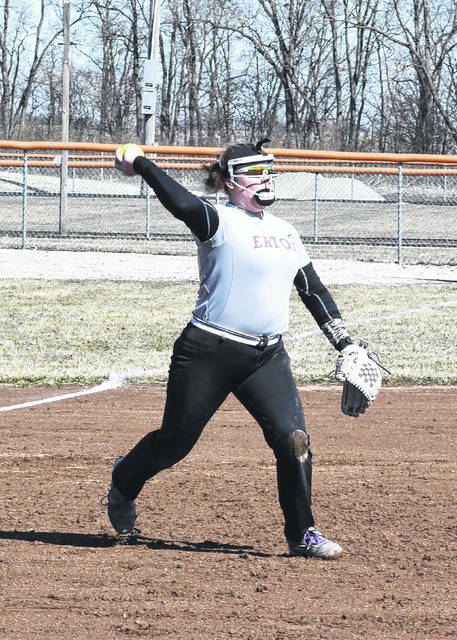 Carsyn Lammers threw one inning in relief. In game two, Eaton jumped out to a 4-0 lead after two innings and led 5-0 after five. In the first inning, Eaton got its offense started, scoring a pair of runs on a single by Worley. In the second, Earley drove in a Dungan and Shepherd with a single. After Ansonia cut the lead to 5-2 after six, the Eagles came back an inning later to add more. Eaton scored three runs in the seventh inning with Mowen, Worley, and Miller each driving in a run. Gels picked up her second win. She went four and a third innings, allowing no runs on two hits, striking out nine and walking none. 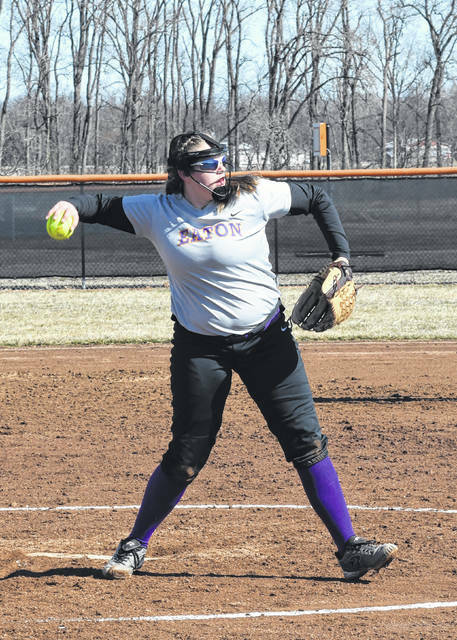 Erica Wilkinson threw two and two-thirds innings in relief. Eaton, now 2-0, was scheduled to play at Franklin on Tuesday, March 26. They will host the Wildcats on Wednesday. On Friday, the Eagles will host Tri-Village. On Saturday, both the varsity and junior varsity will host Coldwater. First pitch is scheduled for noon. 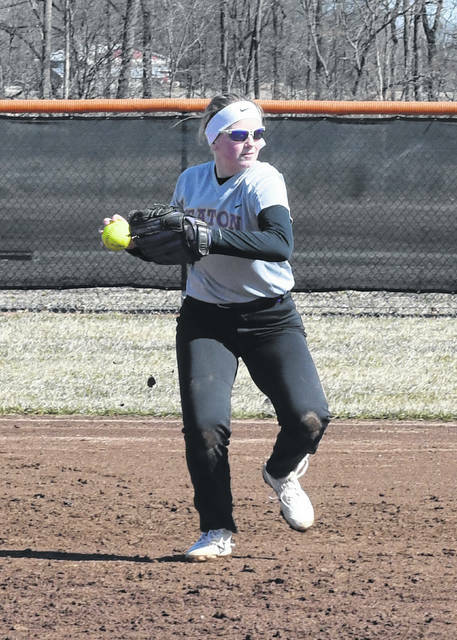 https://www.registerherald.com/wp-content/uploads/sites/41/2019/03/web1_ehssb2.jpgEaton’s Rilee Worley throws to first to get an Ansonia runner out during the first game of doubleheader on Saturday, March 30. 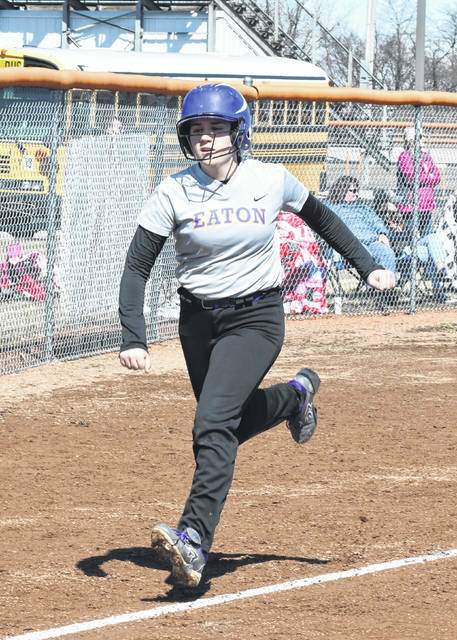 Worley went 6-for-7 at the plate and drove in seven runs as Eaton swept the Tigers 12-1 and 8-2.